As expected, Lenovo has besides a number of other devices at CES in Las Vegas and the Lenovo ThinkPad Helix officially. The 11.6-inch convertible with a view to business customers is expected to be the end of February to have a starting price of $ 1,499. 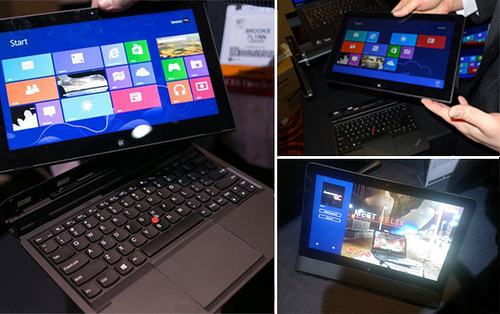 This is the ThinkPad helix known a Windows 8 tablet with keyboard dock. But here you have the opportunity to be plugged, the tablet also averted with the display of the keyboard - in this case, the keyboard acts as a simple stand for the tablet, which I think is a very fine idea of Lenovo.